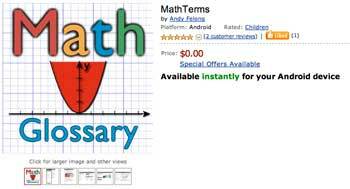 I finally finished the Android version of MathTerms. Its my first Android app and I had my challenges learning all-things-android as well as wrestling with different versions of the Appcelerator Titanium SDK. I spent considerable time ensuring that MathTerms would run well on different resolution tablets. While primarily intended for the very popular Kindle Fire, I did not want to limit the app. It does not run well on smaller screen phones, however. It takes a bit of screen real estate to display glossary entries with images while providing search & browse functions. Check it out at the Amazon AppStore for Android. I could use some (good) reviews!